We’ve been having rice every day and we wanted a change. On Monday night, I decided to avoid rice and cook something simple. 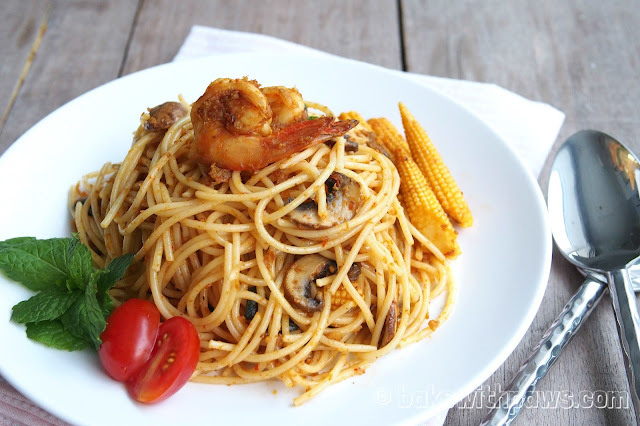 Using some of the leftover Sambal Hebi from the previous night, I cooked Sambal Hebi Spaghetti. I tried this before at a popular restaurant in Kuala Lumpur. They used asparagus and shrimp. I chose to use mushroom and baby corn instead. 1. Bring a big pot of water to boil over high heat. Add 2 tablespoon of salt. The water used to cook the pasta in should taste just salty. This is very important as without it the resulting dish would taste bland. Add the spaghetti and cook according to the directions on the package, less half to one minute. I set 7 minutes for n. 5 Spaghetti. This is because the pasta will continue cooking in the frying pan and keeping it just under out of the pot will ensure the pasta remains al dente. Once the pasta has been put in the pot to cook, you can start the frying pan. 2. Heat olive oil over medium heat. Saute garlic till fragrant, add in prawn and pinch of salt. Stir well then add in mushroom, baby corn and sambal hebi. If it is too dry, add some water. Add in some water and toss it well. 3. By this time, the pasta should be ready. Add the drained pasta to the frying pan and toss through well. Add 1 tablespoon of the cooking liquid at a time in along with the pasta as you toss if it is too dry. 4. Turn off the heat and serve immediately. Garnish with some mints leaves and cherry tomato. Please enlighten me should I put 135g liquid or 145g liquid. 135g (2 eggs + water or all eggs) for making spaghetti. For making the spaghetti manual, please add more liquid. Total liquid will be 145g. Do we boil the spaghetti or steam? As you state 2) Steam the spaghetti for 10 - 15 minutes and set aside. 150 ml – 200 ml white wine, instead if use hua tiao wine, how much to use. Thank you for asking. 135g liquid is for Philips Noodle Maker and 145g if you make manually by hand. Steam first and let it cool. Then boil when you are ready to use. I find that this method the spaghetti is firm and nice. About 2 to 3 tablespoon of Shaoxing wine. Taste first before you add more.